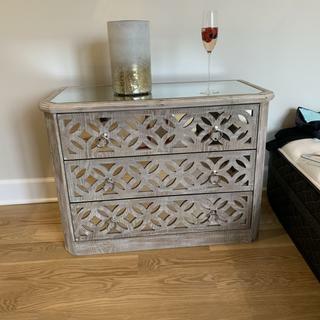 A beautifully intricate latticework design over a shining mirrored finish makes this accent cabinet unforgettably gorgeous. This distressed wood accent chest comes with a shining mirrored top and sides, but its most distinguishing feature is a circular lattice design that adorns the front. This chest also comes with three spacious drawers with ring handles on each side. The end result is a simply gorgeous piece of furnishing for your home. 33 1/4" wide x 16 1/2" deep x 31 1/2" high. Weighs 72 lbs. Each drawer is 26" wide x 11" deep x 5 3/4" high. Mirrored top is 30 3/4" wide x 14 1/4" deep. Wooden three-drawer accent chest from 55 Downing Street. Ash veneer MDF construction. Fir wood legs. Wooden drawer glides. I want to put this in a bathroom for storage of towels etc. it will go beautifully with the brushed nickel n silver and blue colors of the room. I chose to buy two of these as nightstands for our high-profile king sized bed. They are beautiful, and they’re the perfect size, too. The extra storage will come in handy. I’ve had my eye on them for weeks, so happy they went on sale! I like the mirrored look and the neutral color of the wood. What is the charge for shipping? Does the dresser come assembled? BEST ANSWER: Please feel free to contact one of our knowledgeable Lighting and Home Décor Specialists who can provide you with a shipping quote based on your shipping destination. They can be reached by phone, email, or chat: https://www.lampsplus.com/contact-us/. Minor assembly is required (attach bottom legs). I can’t answer about the shipping cost because we had them shipped to the store and picked them up there, free of charge. I want to say it was around $60 for 2 of them, that’s why I had them delivered to the store. They were fully assembled except for the legs. Very easy to put them on. I did not pay for shipping as I had it sent to the store. The dresser was assembled, with the exception of the feet. It was very easy to add the feet. A small tool is included to tighten the screws. I bought 2 and the shipping was $60. They also came assembled so it was super easy! How much it measures of height including the legs? BEST ANSWER: Hi, the overall height including the legs is 31.5" high. BEST ANSWER: Each drawer measures (inside) 5.75" high x 26" wide x 11.12" depth. Do you have this available in a side table? BEST ANSWER: I'm sorry, we do not have a matching side table for this accent chest. What type of drawer guides? BEST ANSWER: Hi P White - This chest has wooden drawer glides. What kind of wood is this and how much does it weigh? BEST ANSWER: Hi - this design has an ash veneer wood finish with fir wood legs. We purchased 2 of these to use as night stands and they are perfect. They are built well, sturdy and very attractive. Recommend this to whomever may want to purchase one. Absolutely love this piece of furnishing. It looks great in my guest room. Beautiful, sophisticated, and user-friendly. I bought this for my daughter's birthday last year. She was truly happy and enjoys it much. I was looking for a chest to put in a new bathroom for towels and and a few linens. It's perfect for what I was looking for! The room is a grey color with lots of white and Brushed Nickel and this will sparkle in there when the room is complete!! I purchased 2 and will use them as a nightstand. The chest is stunning and great quality. I still have to attach the legs. Love! I still have the attach the legs. It is the perfect size for a nightstand.